The book is several hundred pages long. It has over 20 colour plates, as well as many more black and white photographs, line drawings, and graphs. 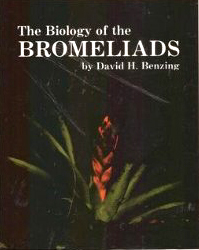 Dr. Benzing wrote this book to fill a gap between presentations in the scientific literature on a range of topics related to bromeliad growth, for example, water requirements, nutrition, photosynthetic and reproductive strategies; and the "how to grow them' - type manuals and articles which approach these topics from the perspective of most amateur growers. The great strength of this book is the presentation of, and range of material related to the growth habits and requirements of bromeliads in a manner which enables the reader to draw practical conclusions on ways to improve their cultural practices. While Dr. Benzing devotes an entire chapter to this topic, "insights" emerge throughout the book. Parts of the book are somewhat "dated" with the passage of time. For example, quite a few of the species' names have changed. A more significant issue is that a reader without a high school - level knowledge of biology will find the book "heavy going". For such a person some parts of the book may need to be re-read several times before one fully appreciates the implications of the text for day-to-day bromeliad growing. However, in my view, this effort will be amply rewarded with the knowledge you gain.